Now we have Visual Studio 2017 and again it is awesome! Drop what you are doing and start developing with it right now! 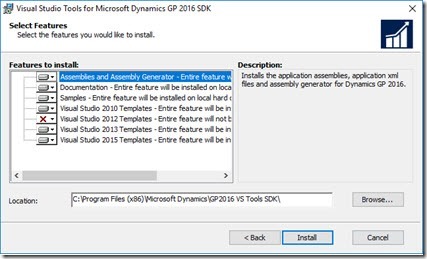 If you are a .NET Dynamics GP Addin developer you will find that the project templates are not available for Visual Studio 2017, at the time of writing this. See in the screen shot, only goes up to VS2015. 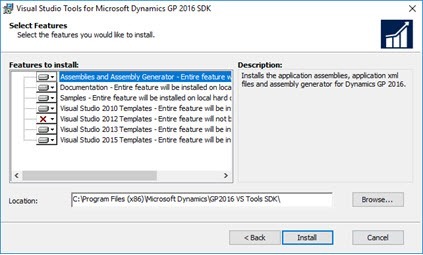 I wrote a post on how to install them into Visual studio 2015 a while back, when the previous version of GP did not support that VS2015, but that method cannot be used anymore for Visual Studio 2017. 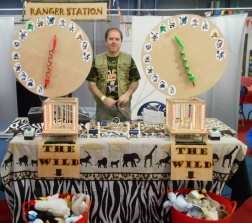 This is because of a new method of discovery that Visual Studio uses for project templates. 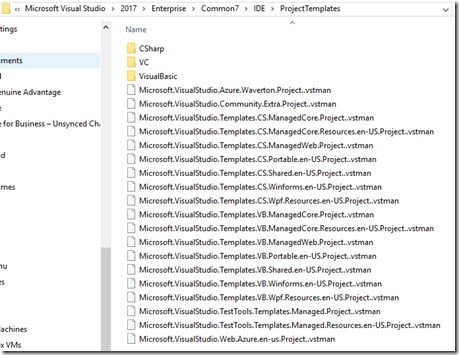 This has been implemented by Microsoft for Visual Studio 2017, using manifest files to point to the project templates. I’m guessing this is part of making Visual Studio more quick and to perhaps work with marketplace better. below you can see the .vstman manifest files that point to the templates. 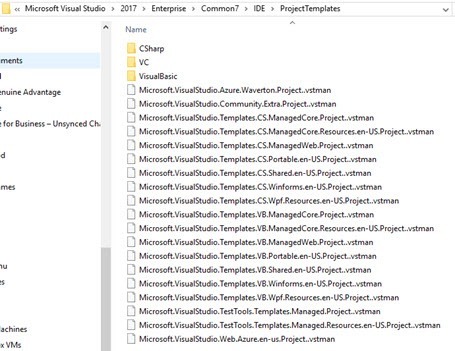 The directory structure of the templates has changed a little too, having a 1033 or similar folder holding them and a another manifest file, “Windows.VSTDIR” above each of those folders. 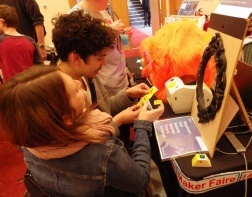 To make things simple I have added a Visual Studio Extension into the Visual Studio Marketplace that addresses this problem, see here for details. 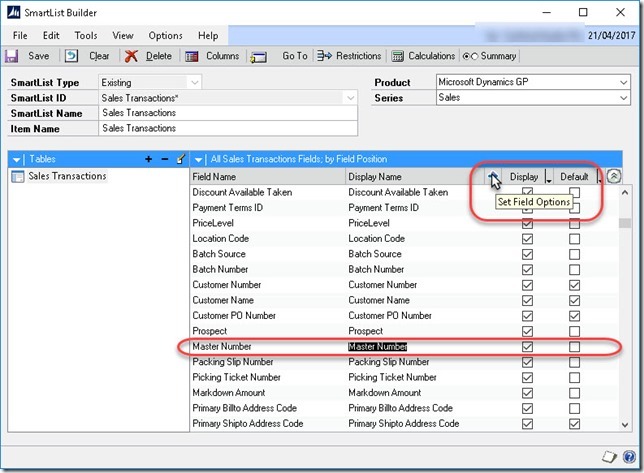 Searching on the Master Number field in the normal Sales Transactions smart list in Dynamics GP can cause an error to occur. In the following screenshot you can see the search, nothing odd there? This is shown below, both the screenshots are of the same dialog, with the error scrolled down to read it. What causes this? The error from an internet search seems to occur in reporting when formatting numbers into text, this was the clue I needed. 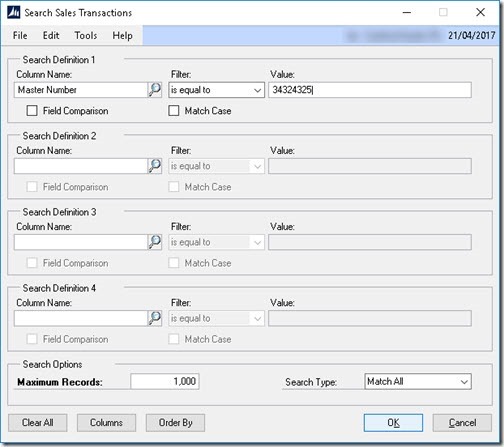 If someone has configured the master number field to be formatted with a comma separator, then this will make the field unsearchable due to this error. To correct the issue, check the format of the field. Click modify on the smart list results window, this will launch the SmartList Builder window. Locate the Master Number Field and click its display name to get the row selected. Then click the field options icon as shown in the screen shot below. 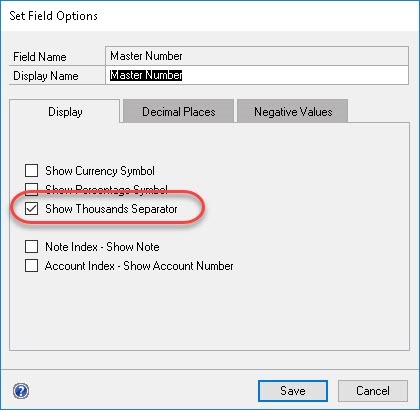 The field options window will open, uncheck any formatting in this window, in this case, take off the show thousands separator. Save the options window and then the SmartList Builder window. Attempting the same search again will now work normally with no exceptions. 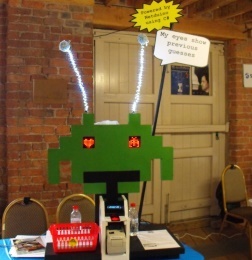 If this helped let me know with a comment, it motivates me to blog more! 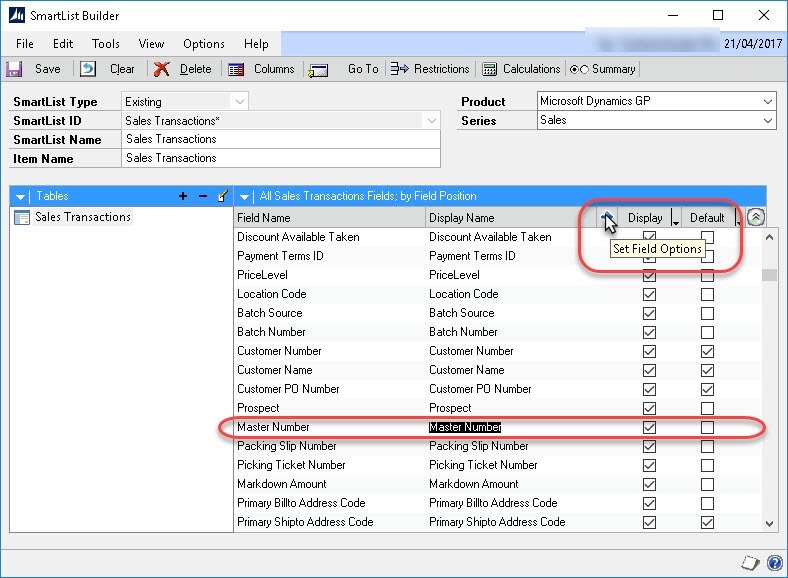 When developing Dynamics GP addins, the above error can occur for a number of reasons. It generally means what it says, the referenced assembly is looking for a resource it can’t find on the available search locations. 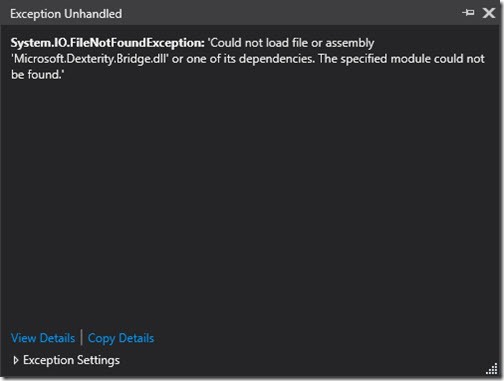 If this is encountered whist developing a Dynamics GP addin while attempting to run the addin as an application outside of GP (say in debug from Visual Studio), then this error may well be encountered. What the developer may find odd is that it will work when ran from GP as an addin. 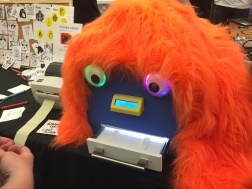 Why is this so? 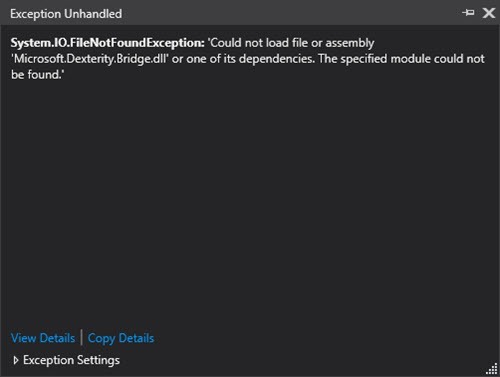 The “bridge dll” is the eventing route between GP and .NET applications (including addins) but it has other dependencies from the dexterity shared components. These are required to be present on the standard system environment paths searched when looking for dlls (search online for dll dependency search paths for more info). 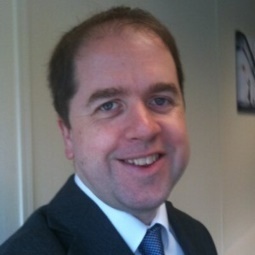 When the addin is ran normally, as an addin by the Dynamics GP process, the dependencies are provided by Dynamics GP process, from the process’s application folder. When running a free standing GP app, from the debug folder of Visual Studio, then the dependencies must be made available to the application through putting the dlls in the .net application’s folder (or other path that will be searched). By placing TNTLIB.dll and DDAPI.dll into the bin folder should solve the problem. Strictly speaking xdll32.dll and Bidi32.dll should be included too (search online for stand alone Dexterity applications). In Visual Studio this can be achieved consistently by including the files in the project and setting them to copy to output. However it may be preferable to only do this for debug builds, that should be possible with Visual Studio post build steps or manually. The following are the files that should be included if running stand alone. 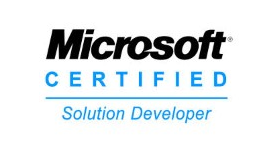 Microsoft.Dynamics.Framework. 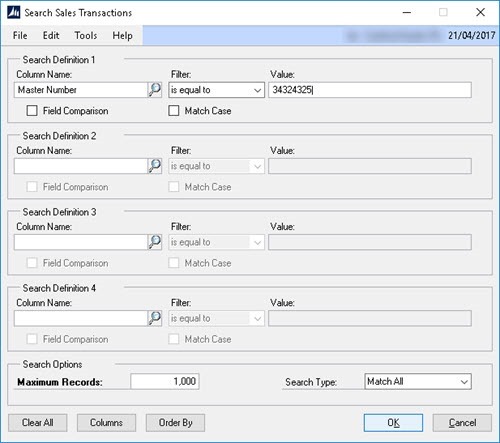 UI.WinForms.Controls.dll .NET windows controls. 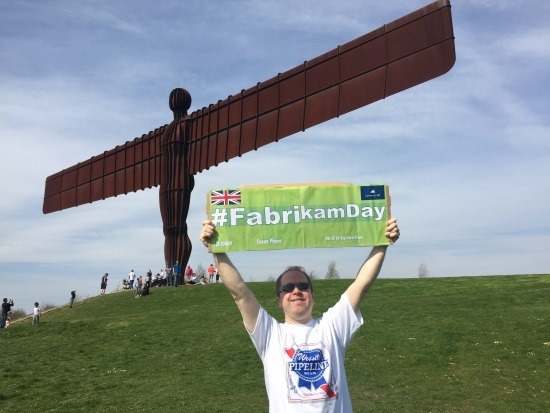 Around the world people are posting photos of local landmarks and a #FabrikamDay banner, just for fun and to celebrate a sense of community around our product, Microsoft Dynamics GP. The date is a random date that was in the future, chosen to be used for the test company data in Dynamics GP.